Invest from 100 EUR. 120+ Investment Providers Worldwide. Get the best investments. Invest from 100 EUR. Discover the opportunities where to invest. Build an international portoflio of property investments directly and with small amounts. 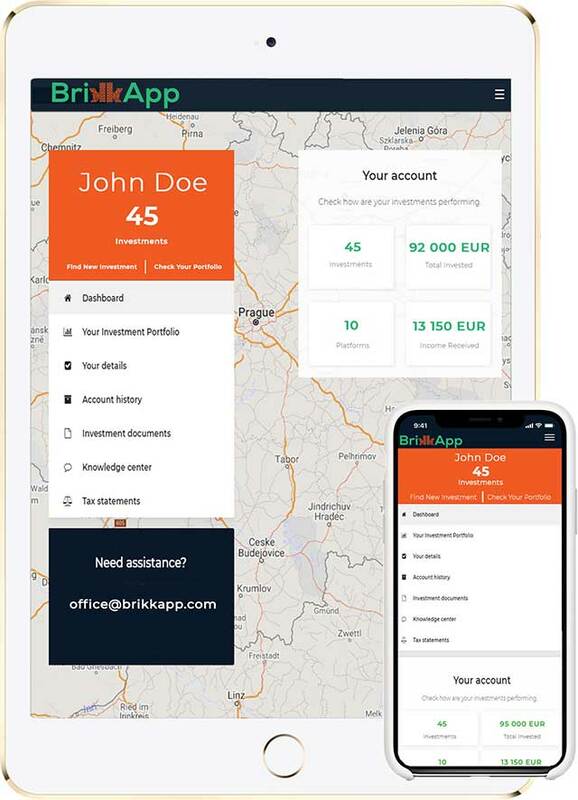 Join the BrikkApp ecosystem and advertise your product to investors worldwide. Let your opportunities stand out. Easy API onboarding. BrikkApp gives you the opportunity to find direct investments in real estate properties worldwide. We evaluated hundreds of property investment platforms for you. Make an educated decision through comparing and contrasting dozens of fact-based data about the crowdfunding real estate platforms out there. Read reviews and make better decisions with real opinions of investors like yourself. Let your money work for you. Get a regular return and reward payment at the deal maturity date. Check the performance of all your investments in one smart dashboard. Buy, sell and analyse using BrikkApp. Sell any of your investments anytime. Your investment is not locked in a specific platform for a number of years anymore. Protection of your investment and personal data is crucial for us. We ensure appropriate data visibility only, secure transactions, authentification and verification. Transactions cannot be modified, inserted or deleted.